Are lawsuits out of control? Doctors in some parts of the country are facing double-digit increases in their malpractice-insurance premiums and blaming the problem on runaway jury verdicts in malpractice suits. Many states already have limited damage awards in malpractice cases. President Bush is now asking Congress to set a $250,000 cap on non-economic or so-called pain-and-suffering damages. 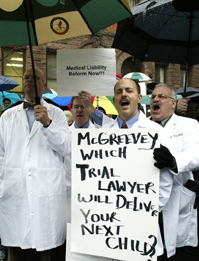 But trial lawyers and consumer groups say malpractice suits are not out of control. They claim that insurance companies are raising premiums because of poor underwriting decisions and low investment returns. They also warn that limiting lawsuits hurts victims of egregious medical mistakes and reduces incentives to protect patient safety. But doctors contend that high liability expenses drive up health-care costs, thus reducing access to treatment.